Have you ever dream to drive your own bike? Well, in this game everything is real! Just use all your skills and try to avoid any impediment. Everything is up to you now. Just use the arrow keys to control and be the real champion! Have much fun! In this game you must show us all your driving skills, cause here, you will face to so many obstacles and jumps set in a military controlled desert zone. 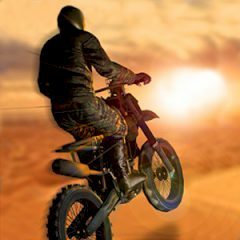 Just race through the levels at high speed to avoid the ongoing war! Here you can use the ramps to jump and perform insane back or front flips! So, the choice is yours! Sit back, relax and enjoy the beautiful 3D graphics this game has to offer! You have to use your bike training to find your way to safety by completing these brilliant levels. Are you ready? Then move forward!